M T D J u n e 2 0 1 8 16 N e w s / V i e w s GRI plants trees Global Rubber Industries Pvt. Ltd. (GRI) planted more than 50 trees as part of the grand opening of its specialty tire manu- facturing facility in Sri Lanka. GRI officially opened the $40 million predominantly radial agricultural tire plant on Jan. 25, 2018. Point S adds 2 dealers The Point S expansion in Canada contin- ues, with two stores in Alberta joining the group of independent tire dealers. 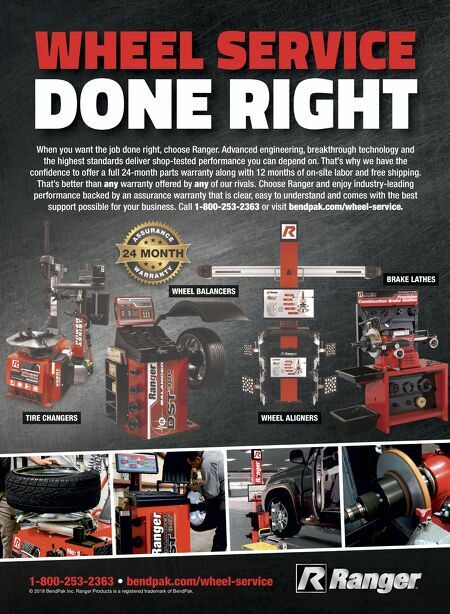 They are Action Tire in Bow Island and Tech N Tire in Whitecourt. Yokohama has OTR tire guide Yokohama Tire Corp. has created an 82-page off-the-road (OTR) tire sales and reference guide with key OTR tire and maintenance guidelines, as well as information on its OTR products. GM extends warranties General Motors Co. (GM) has extended the warranties of more than 281,000 Genuine GM and ACDelco replacement parts to 24 months and unlimited miles. Maxxis sponsors contest Maxxis International is sponsoring the Fu- ture Tire category of an innovation contest open to any undergraduate or graduate student in the U.S. The company wants to encourage college students to enter the tire industry. Promotion rewards installers Five 2019 Chevy Silverado pickup trucks and 15 cruises will be awarded in the latest installer promotion from Fisher Auto Parts. The "Wow! Earn and Win!" promotion runs through Dec. 31, 2018. Radar line expands Omni United (S) Pte. Ltd. is adding 38 SKUs to the Radar truck and bus tire line. The additional sizes give the Radar commercial truck tire line 65 SKUs. The plan is to add 24 more SKUs by the end of 2018. Nokian reduces emissions Nokian Tyres Inc. surpassed its goal of reducing carbon dioxide emissions by 20% at its plants three years ahead of schedule. The tire maker has stepped up its efforts by joining the Science Based Targets initiative. Bites Monro acquires Free Service Tire USTMA denounces tariffs on steel and aluminum imports M onro Inc. has acquired 99-year- old Free Service Tire Co., adding an expected $47 million in an- nual sales to its balance sheet. e acquisition includes the Johnson City, Tenn.-based tire dealer's 12 retail and commercial stores, four wholesale distribu- tion centers and one retread facility. And it extends Monro's footprint in Tennessee, North Carolina and Virginia, adding to the company's 130-plus locations in those states. Monro says it will continue to operate all Free Service Tire locations and retain store-level, wholesale and retread associates. "is acquisition expands our footprint in the South, while providing Monro with an even stronger platform for further growth in these markets," says Brett Ponton, CEO and president of Monro. Lewis Wexler Jr., president of Free Ser- vice Tire, says, "We have been approached by many companies over the years, but it wasn't until Monro came along that we found the right fit for our customers, our employees and our company. Monro has a tradition and business model much like ours, and I am confident that Free Service Tire's tradition of outstanding customer service will continue under Monro's ownership." Monro says it expects the deal to add approximately $47 million in annualized sales, representing a sales mix of 15% service and 85% tires. O n May 31, 2018, the Trump ad- ministration imposed tariffs on steel and aluminum imported from Canada, Mexico and the European Union. 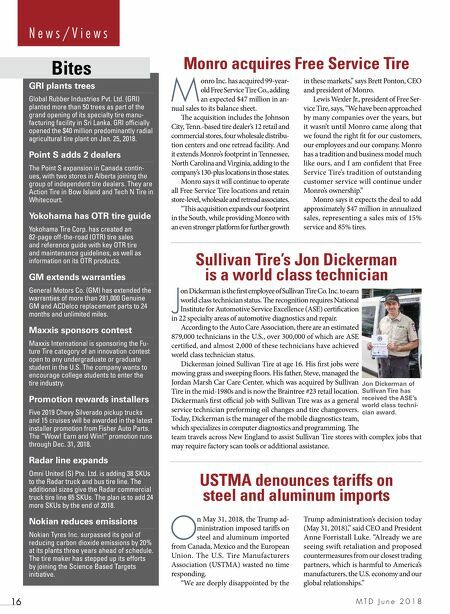 The U.S. Tire Manufacturers Association (USTMA) wasted no time responding. "We are deeply disappointed by the Trump administration's decision today (May 31, 2018)," said CEO and President Anne Forristall Luke. "Already we are seeing swift retaliation and proposed countermeasures from our closest trading partners, which is harmful to America's manufacturers, the U.S. economy and our global relationships." Sullivan Tire's Jon Dickerman is a world class technician J on Dickerman is the first employee of Sullivan Tire Co. Inc. to earn world class technician status. e recognition requires National Institute for Automotive Service Excellence (ASE) certification in 22 specialty areas of automotive diagnostics and repair. According to the Auto Care Association, there are an estimated 879,000 technicians in the U.S., over 300,000 of which are ASE certified, and almost 2,000 of these technicians have achieved world class technician status. Dickerman joined Sullivan Tire at age 16. His first jobs were mowing grass and sweeping floors. His father, Steve, managed the Jordan Marsh Car Care Center, which was acquired by Sullivan Tire in the mid-1980s and is now the Braintree #23 retail location. Dickerman's first official job with Sullivan Tire was as a general service technician preforming oil changes and tire changeovers. Today, Dickerman is the manager of the mobile diagnostics team, which specializes in computer diagnostics and programming. e team travels across New England to assist Sullivan Tire stores with complex jobs that may require factory scan tools or additional assistance. Jon Dickerman of Sullivan Tire has received the ASE's world class techni- cian award.